The Greek avant-garde composer Anestis Logothetis was noted for his pioneering tape techniques as well as developing his own notation system for composition that incorporated visual symbols meant to be interpreted by the performers. 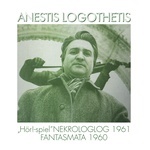 "Hör!-spiel" / Nekrologlog 1961 / Fantasmata 1960 collects three of his most famous works, realized in Vienna where he spent much of the 1940s-1960s. After completing studies at the music academy there, in the 1950s Logothetis became enamored of 20th century composers like John Cage and Earle Brown, and moved away from traditional composition for orchestras and performers in favor of fully electronic composition in the late '50s. A groundbreaking composer and electronic musician, Logothetis has long been underappreciated by the world of avant-garde and electronic musicians but Fantôme Phonographique seeks to rectify that issue with this brilliant release.